Florals aren’t always sweet. A little denim here and a little leather there, voila! Thank you to Love Eyecandy for my black beaded bracelets. I’ve been in love with beaded bracelets for quite some time now but I can’t seem to find black ones that I like. These are just perfect! You can order them individually or in sets of 5. Each bracelet has one gold charm hanging from it, like heart and peace charms. 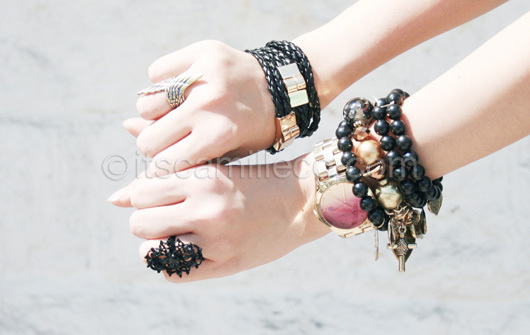 Visit Love Eyecandy’s Facebook page and blog to see more of their accessories. Beautiful. What is your skin secret? Beautiful. What do you apply on your skin, you look really flawless. Your styling here is really SUPERB! I love everything in it! :D Denim, floral, and leather…who knew they could be mixed together in one outfit haha!